First-person Shooter (shortened FPS) is a popular video game genre deals with shooting, exploration, and combat elements. It is one of the most famous genres ever. Moreover, a series of high-value video games have come from it, including Battlefield, Call of Duty, Halo, and others. You can’t believe that a huge supply of FPS (First-person shooter) video games are available on Android and iOS platforms for you to explore. 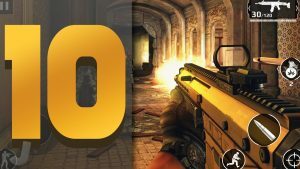 In simple, if you’re a fan of FPS genre and are looking for best First-person Shooter Games for mobile devices, then you’re in a right place, where you’ll figure out Top 10 Best Games ever. Critical Ops (stylized C-OPS) is a First-person Shooter and Multiplayer video game by Critical Force available to play on Mobile devices. The game lets you select to be a part of anti-terrorism force with an objective to fend off massive destruction or play as a terrorist to spread destruction and chaos everywhere. It comes with Online Multiplayer modes, Decent Graphics, Global Leaderboards, etc. to create a brilliant overall experience. Be a soldier or a terrorist to show off your skills while playing the game. Dead Effect 2 is a Sci-fi and First-person Shooter video game with an emphasis on Horror-Survival and Role-playing elements. You assume the protagonist’s role in the game by choosing one of three different characters. Furthermore, you can use tons of gears, body implants, and weapons to locate and level-up over the game’s course. The game introduces over twenty hours of challenging campaign, and dozens of options for upgrading. During the gameplay, you’ll be able to level-up your character as well. With fantastic visuals and a fun story, Dead Effect 2 is one of the best FPS video games to play. Gun of Boom is one of the best FPS games, introducing a cartoon-style environment as well as characters similar to some famous shooters games on console and PC. The game isn’t as good as those, though it features a variety of weapons, a loot box system, and online PvP (Player versus Combat) system. It features auto-fire system, letting you rest while shooting at enemies. The game uses decent graphics that work well for it being a mobile shooting game. Hitman: Sniper is a unique FPS video game where you as the sniper are perched outside of the building, searching for the target with a sniper rifle. The ultimate job is to take down different targets without getting suspicious your location. The game comprises more than 150 challenging missions with increasing difficulty, a series of rifles to unlock, global leaderboards, and has some strategy components. Into the Dead 2 serves as the sequel to the famous zombie action video game Into the Dead. The game sets out you on an epic journey through the zombie-apocalypse where you must survive as long as possible while facing blood-thirsty zombies. In-game, you can equip yourself with a huge arsenal of weaponry and perform whatever you need to survive. Explore the breathtaking world, where no one is safe, how far you’ll go to keep your character alive? It comprises up to seven action-packed chapters available contains sixty different stages and hundreds of challenges to complete. Dead Trigger is a zombie-themed FPS video game with heavy emphasis on Horror-Survival elements developed by Madfinger Games. The game starts with a map screen option, where you can choose available missions or can access several features, including casino, ship, and arena. The game features several generic missions as well as story-based missions. Moreover, you can play a bonus mission each day for the bonus. Modern Combat 5: Blackout developed by Gameloft Bucharest is a First-person Shooter, Single-player and Multiplayer video game for mobile devices. It is the 5th entry in the series of Modern combat and serves as the sequel to Modern Combat 4: Zero Hour. Blackout offers the similar gameplay to previous four entries and enables you to run, shoot, crouch, throw grenades, sprint, aim, leap to the obstacle, pick up weapons, etc. your way through a series of challenging missions. Team Battle, Rush Mode, Duels, Zone Control, VIP, Squad Battle, etc. are prominent modes to enjoy. Morphite is an Adventure and one of the newer First-person Shooter video games available to play on cross-platform. In the game, as the protagonist, you can explore the procedurally generated planets with different landscapes and creatures. The game features a storyline and its free version enables you to manipulate as many planets as possible and play the first two challenging missions. You must pay to unlock the full storyline mode and access to all of the weapons and power-ups. N.O.V.A. Legacy is the latest version the franchise of famous First-person Shooter video games. The game takes place in the sci-fi setting and comes with a full campaign mode, several game modes, stunning visuals, and more. During the game, you are capable of crafting and upgrading your weapons as well as equipment. Some territories of the game feature, including character customization, leaderboards, and multiplayer mode. A veteran N.O.V.A. marine, named as Kal Wardin is summoned once again to strike against the vicious enemies of the Colonial Administration forces. During the combat, you are helped by Yelena, your personal AI (Artificial Intelligence) Agent. PUBG Mobile is a Battle Royale video game on PC and console. The game takes you on an island with other 100 players from all over the world. The main job is to be the last one left standing on the island. The environment is full of gear, vehicles and weapons, and competitors as well. During the game, you have to find and scavenge your supplies and weapons, and struggle takes down every player available in the tactically and graphically battleground. Get ready to loot, land, and do whatever you need to survive and struggle to become the last man standing on the island. For further details, please visit Sbobet Asia.